Here is the latest Cebu Pacific seat sale which can be booked until September 28, 2016! The new promo fare of Cebu Pacific Air is good for trips to select local and international routes. Book your tickets and fly from Manila to Bacolod, Cebu, Iloilo and other popular Philippine destinations. The Cebu Pacific International promo fare includes flights to Hongkong, Singapore, Macau, Taipei and several other routes. Fly to Kota Kinabalu or Xiamen for as low as P1,699 or travel to the Middle East destinations of Dubai, Kuwait and Riyadh for as low as P4,199. Hongkong and Singapore seat sale is as low as P1,999 or P2,499 depending on which airport you started your trips to these places. Travel dates covered by the promo are: October 15-31, November, December 2016 until January 31, 2017. So, you can check for affordable tickets for your Christmas or New Year vacation. So, do not wait until the last booking day as promo tickets might not be available anymore. 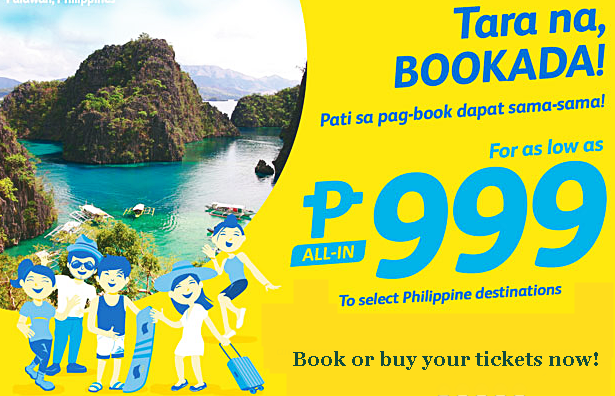 Book your Cebu Pacific promo fare tickets now! Quoted Cebu Pacific promo fare ticket covers the base fare, taxes and fees, web admin fee and free 7 kilos hand carry bag and is valid for one-trip only. Online booking of the Cebu Pacific sale tickets at www.cebupacificair.com. Promo code not needed for booking. Domestic flights terminal fees for non-Manila/Caticlan/Cebu airports and International Terminal Fees for non-Manila stations are to be paid at the airport as well as the P1,620 International Travel Tax. Cebu Pacific promo fare tickets are LIMITED and are not refundable, but can be rebooked subject to rebooking fees of P1,500 for domestic destinations, P2,300 for short haul international flights and P2,800 for long haul destinations plus fare difference. Cebu Pacific guests may avail of check-in prepaid baggage allowance, flight changes and self- check-in services which are available up to 4 hours prior to the scheduled flight departure. For more updates on PISO FARE, promo fare and travel tips, LIKE and FOLLOW us in Facebook: PISO FARE TICKETS!! !